Quintessentially British design and exquisite craftmanship combine with the vintage-inspired Emmy London collection. Crafted in 18 carat white gold, this ring delicately holds a 0.25 ct round halo cut diamond which is beautifully offset by the yellow gold band, making for a unique aesthetic that is guaranteed to make an impression, and be cherished forever. Featuring I1 certified diamonds and an independent GSI certificate. 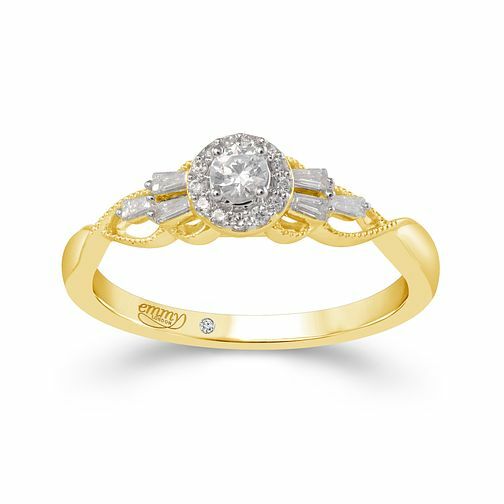 Emmy London 18ct Yellow Gold Halo 0.25ct Diamond Ring is rated 1.0 out of 5 by 1. Rated 1 out of 5 by Anonymous from Terrible ring. Diamonds falling out. Supposed to be a happy moment and not even a week goes by and a diamond falls off. Sent it off to get it repaired, they said it would take 2 weeks to come back. Ends up coming back in 3 days and guess what, the diamong is wobbling on the ring. I saw a comment on the platinum version that their diamond had fallen out, i thought that might have just been a one off but nope. I tried looking for that comment again, and it looks like theyve removed the platinum version off the website. Will be returning to the store for a full refund.